1. Heat the oil in a frying pan and fry the pork to brown. Add the onion, apple and sage and fry for 3-4 minutes. Add the stock and ginger beer, bring to the boil and simmer for 5-6 minutes or until the pork is cooked throughout with no pink meat and the sauce has thickened. 2. 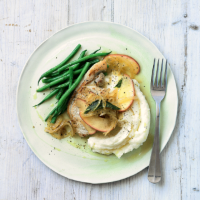 Serve with mash and fine green beans.